Dogs need basic nutrients and to be fed at least once a day. Puppies and dogs younger than one year need to be fed more often. They should also have access to clean water. Regardless of how tight your living situation is, you dog needs to exercise. For those living in suburban or rural areas, this may entail installing an electric fence. New York City residents, on the other hand, may need to hire a dog-walker. Your dog needs to be groomed and cleaned on a regular basis. Most common breeds should be fully bathed at least twice a year. Your dog should have a warm and safe place to stay indoors as well as a safe way to travel with you if you take it in the car or on a plane. Lastly, your dog should have access to veterinary care, including vaccinations, medicines, treatments, and surgeries (like spaying or neutering). Within New York state, your dog must be licensed, and within New York City, your dog must have a license tag on its collar. While off of your own property, your dog should be on a leash. When on your own property, it’s important to keep your dog inside with a physical or wireless, hidden fence. New York is a strict, “one bite” state, where damages can be sued for early on. Also, be sure to clean up animal waste; it’s the law in New York. Rabies vaccination is required in New York state for cats and dogs. Dogs are not typically allowed inside of restaurants or other food service establishments. When using classic conditioning, an owner should know that positive reinforcement techniques are better than punishment techniques. What positive reinforcement means is that behaviors that are good are rewarded with treats, play, or attention and that bad behaviors are not rewarded. Consistency is key with any training, especially when you’re training a puppy. Make sure that everyone in the family is on board. Communicate clearly with simple, one-word instructions, hand gestures, or motions. Some dog trainers even like to use a clicker along with treats for an immediate reward system. Always be the “alpha dog” and have your dog recognize you as the pack leader. Simply be calm and assertive. Common issues like jumping on counters or getting into the trash can be solved with training along with a wireless indoor electric room transmitter. Remember that if you’re not sure what to do, you can always call a professional. Get help before you get frustrated. To help your dog get the exercise it needs, owners should establish a wide-open space with safe boundaries and train the dog to respect those boundaries. Those living in confined areas like New York City should make the effort and time to walk their dogs in local parks on a regular basis. Physical fences are great; however, be careful if your dog is a digger. Enthusiastic dogs can still get out. This could lead to the dog possibly getting into traffic or having bad interactions with other dogs, people, or wildlife. Give your dog a space to roam in your back or front yard by installing a hidden fence. NY residents can purchase an out-of-sight, underground pet fence in large spaces to keep their dog and other dogs safe. If you want to continue to keep your dog well-trained and safe in the state of New York, definitely consider purchasing an electric dog fence. 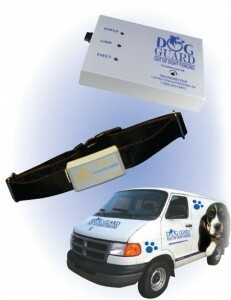 NY locals can trust Dog Guard, as it’s a locally-owned business centered in Troy, New York. Since 1988, we’ve been helping families protect their pets, and today, we provide help and services nationwide. Call us today at 1-800-865-0495 or browse our frequently asked questions to learn more. Get a free quote for our customizable services now!